One of our staff members recently returned from a visit home. 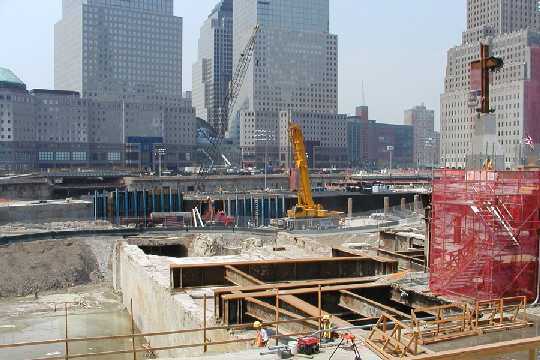 As we come upon the anniversary of the World Trade Center and Pentagon disasters, we respectfully share the photos of the World Trade Center disaster site in New York City with you, our readers. The World Trade Center/Ground Zero viewing area at Liberty Street and Broadway. 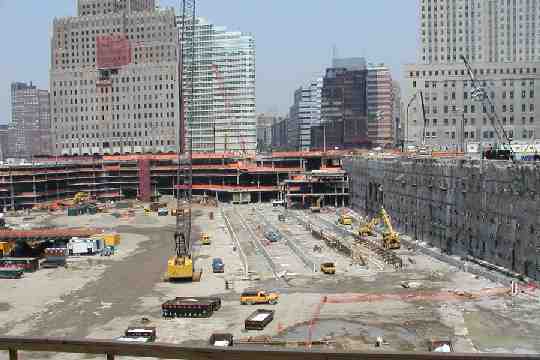 The former 16-acre Trade Center looks like a big construction site. Two 110-story high buildings stood here. The building in the background, the World Financial Center, with the square red mesh is one of many that sustained damage and is in the process of repair. The holes in the wall is where the PATH train used to run underground through WTC. 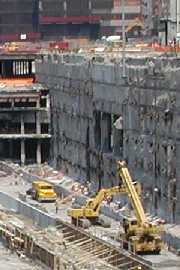 The PATH train station was on the lowest level of the World Trade Center complex, 7 floors down. The workers are currently shoring up everything, to build a new transit hub near Ground Zero, linking the PATH with subway lines in lower Manhattan. Looking west to the American Express buildings, is the area to the right of the wall where the new hub is under construction. See the metal cross in the upper-right section of the picture? That was found in the debris as is, and is now mounted as a monument at the site. This cross, one of several found in the debris of the U.S. Customhouse at 6 world Trade Center, was preserved by construction workers and blessed by clergy in a solemn ceremony held outside the building on Thursday, October 4, 2001. A wrought iron fence around St. Paul's Cathedral right next to WTC, where people started posting signs for missing persons. 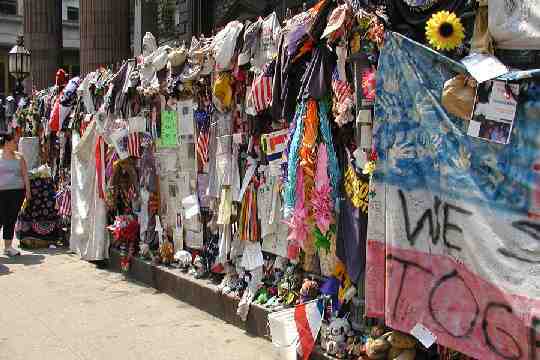 People from around the country and from around the world came to leave memorials for those who died there. It still stands today as a memorial to those who were lost. It is a very emotional site. St. Paul's, a chapel of Trinity Church, suffered only a few broken windows. A bit of history, George Washington worshipped at St. Paul's Chapel. The World Trade Center included some seven buildings: One and Two World Trade Center consisted of two 110-story office towers, Seven World Trade Center was a 47-story office building, Four and Five World Trade Center are 9-story office buildings, Six World Trade Center is an 8-story U.S. Custom House, and Three World Trade Center was a 22-story hotel were all constructed around a central five-acre landscaped Plaza. All seven buildings have entrances onto the Plaza as well as onto surrounding city streets. The Mall at the World Trade Center, located immediately below the Plaza was the largest enclosed shopping mall in lower Manhattan, as well as the main interior pedestrian circulation level for the complex, stations for three of New York's subway systems (IRT, IND, BMT) were located below the tower in the Mall. On the morning of September 11th terrorists hijacked four commercial jet planes and attempted to fly them into several U.S. targets. They used American Airlines Flight 77 like a missile and crashed it into the Pentagon at 9:38 AM. The Pentagon caught fire and part of the building collapsed. In this tragic event 189 civilians and military personnel lost their lives. This attack was done in concert with the attack on the World Trade Center. The terrorists planned to fly United Airlines Flight 93 into a key U.S. target like the capitol building as part of their terrorist campaign that included the Pentagon and the World Trade Center. However, the terrorists got more than they bargained for on Flight 93. Some of the passengers had heard of the events surrounding the other terrorists targets and took action. The terrorists discovered first hand the resolve of Americans under duress and in their final moments maybe glimpsed the will that has made America great. These heroes epitomized the sacrifice and courage this great nation was founded upon. Although, authorities are unclear of the exact sequence of events involving this flight, they are sure these Americans died protecting the lives of countless others. The groundbreaking ceremony for the Pentagon took place on September 11, 1941  exactly 60 years before the terrorist attack in 2001.